The evening features excellent Chinese dinning, raffle draws, Leos Performance and Karaoke fundraising. Everyone is welcome to sing or pledge someone to sing. Download Pledge Form. Proceed of the evening with be donated to Vancouver Cambie Leos Club and Strathcona Community Dental Clinic – a non-profit clinic for children. 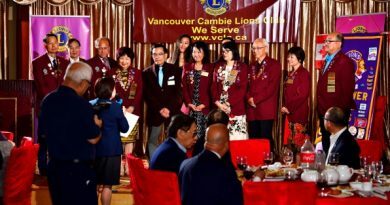 To be installed are the new Board of Directors for Vancouver Cambie Lions Club and Vancouver Cambie Leos Club. 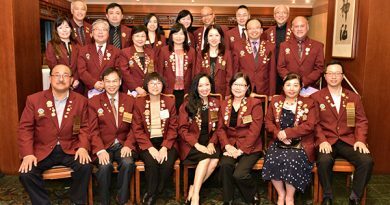 PP Lion Menjou Hui, Lion May Hui, Lion Roger Wong and Lion Dorothy Louie as 1st Year Director. Thanks in advance for all who sponsor table prizes and raffle prizes and most important of all, pledge and sing for Karaoke! We will have lots of fun! Please contact Event Chairpersons Lion Vivian Lo or Lion Johnny Lo for tickets.